With a reputation for being one of the most scenic and beautiful areas in the world, Cape Tribulation is right on the edge of two World Heritage Listed Parks. The Cape Trib Beach House puts you right in the middle of some of the oldest rainforest alive today while still being right on the edge of the coral sea. You can swim right off the beach and see living coral reef, with schools of bright fish. Wander through the forest and you spot the elusive cassowary or one of many other rare creatures that make this forest their home. Cape Tribulation offers an abundance of activities and opportunities. - Be adventurous & energetic as you like or simply find a secluded spot on the beach, relax in the shade of an overhanging tree and watch the world go by. - Experience the Great Barrier Reef, try snorkelling & scuba diving . - Explore the rainforest with either an experienced guide or by yourself. - Enjoy a night out with the native wildlife, try a spotlighting walk. - Sea kayaking is a fabulous way to take in Cape Tribulations breathtaking reef and rainforest. - Cruise through the mangroves and natural wilderness while spotting for large salt water crocodiles. 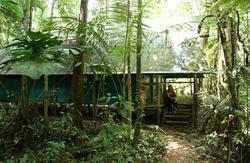 - Visit the Daintree Environmental Centre and learn more about the rainforest. - Indulge in exotic tropical fruits. - Mountain bike the roads and beaches. Cape Trib Beach House features a beachside bistro, bar and pool area where you will be tempted each day by a variety of scrumptious, value for money meals. Only 20m from the bar, bistro and pool deck, direct beach access is available onto pristine Cape Tribulation beach. Other facilities include tour desk, information, email / internet access, self cook kitchen, laundry facilities, luggage store, storage and souvenirs. Cape Trib Beach House offers comfortable air-conditioned cabins and dormitories nestled in lush tropical rainforest. Approximatley 2.5hrs drive north of Cairns. You will need to cross the Daintree River ferry which runs daily from 7am to midnight. 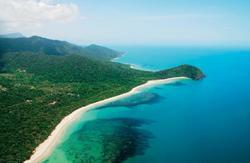 45mins - 1 hr north of the ferry you will arrive at Cape Tribulation. Keep driving to the end of the sealed road and then 2kms further along the dirt road (4WD NOT necessary!) On the right you will find a little slice of paradise you will not want to leave!! The Cape Trib Beach House.